When a kettle is put on to boil the temperature of the water steadily rises until it reaches 100°C. At this temperature it starts to boil, that is to say bubbles of vapour form at the bottom and rise to the surface, where they burst and escape as steam. Once the water has begun to boil, the temperature remains constant at 100°C. But at the same time, heat is being steadily absorbed by the water from the gas flame or heating element. This heat, which is going into the water but not increasing its temperature, is the energy needed to convert the water from the liquid state to the vapour state. Experiment shows that 2260000 J are required to convert 1 kg of water at its boiling-point to steam at the same temperature. This is known as the specific latent heat of steam. “Latent” means hidden or concealed. This extra heat goes into the vapour but does not indicate its presence by producing a rise in temperature. 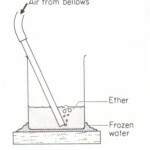 When the steam condenses to form water the latent heat is iven out. This is one reason why a scald from steam does more harm than one from boiling water. Other liquids besides water absorb latent heat when they turn into vapour. For example, 860000 J are required to convert I kg of alcohol at its boiling-point to vapour at the same temperature. These quantities of heat are called the specific latent heats of vaporization. The specific latent heat of vaporization of a substance is the quantity of heat required to change unit mass of the substance from the liquid to the vapour state without change of temperature. (Symbol = I.) The SI unit of specific latent heat of vaporization is the joule per kilogram (J/kg). However, in order to avoid having to write very large numbers the alternative units kJ/kg or Mljkg may be used instead. so we may express the specific latent heat of vaporization of water as 2260 k.l/kg or 2.26 MJ/kg.